Sean Kagy, a veteran of the Maisonette, the Cincinnatian Hotel as well as other fine dining venues in Cincinnati, Chicago and Washington, D.C., recently became chef de cuisine at the Summit Restaurant at the Midwest Culinary Institute. Kagy not only manages the restaurant, but he plays an instrumental role in the education of the MCI students who work there. 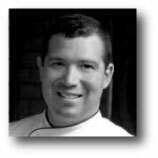 Kagy graduated from the New England Culinary Institute in 1992, then served as a chef at The Inn at Little Washington in Washington, D.C. (a 5-Star, 5 Diamond, Relais & Chateaux property) from 1992-93. He then spent two years at the 5-Star Four Seasons Hotel in Chicago before coming to work at the Maisonette under Chef Jean Robert deCavel from 1994-96. From 1996-2001 Kagy served as executive chef at the Cincinnatian Hotel, managing all aspects of its food service, including its highly-regarded Palace restaurant. In 2001 he left to become executive chef at the Tournament Players Club at River’s Bend in Maineville, and four years later launched his own One Restaurant and Lounge, along with a corporate catering business. At the Summit, Kagy is in charge of an enterprise that functions both as a retail dining establishment and as a hands-on proving ground for advanced students at the Midwest Culinary Institute, one of the largest schools of its kind in the region. One innovation that’s in the works, Kagy said, involves making use of Cincinnati State’s demonstration theater just below the Summit Restaurant. He said he’s planning a series in which he and students will demonstrate how to cook a three-course meal in the theater, then prepare and serve that meal to those guests in the restaurant.